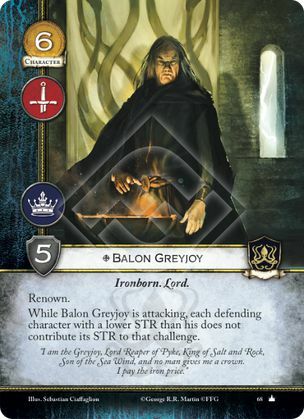 While Balon Greyjoy is attacking, each defending character with a lower STR than his does not contribute its STR to that challenge. "I am the Greyjoy, Lord Reaper of Pyke, King of Salt and Rock, Son of the Sea Wind, and no man gives me a crown. I pay the iron price." This guy can easily get you the unopposed challenges you need for We Do Not Sow for example. With Great Kraken he becomes almost impossible to stop. If you can manage to keep him alive and free from Milk of the Poppy, you will probably win. A challenge is “unopposed” if the defending player counts 0 STR when the challenge winner is determined. This can occur if the defending player controls no participating characters, or if there are defending characters but the total defending STR is 0. Therefore, a defending Baratheon player with the Red Keep in play and at least one participating character in a power challenge will successfully oppose the challenge because his total defending strength is 2.